Question: Since other methods of communicating have replaced the chalkboard, what do teachers have misbehaving students do after class now that they can no longer clean the erasers? If I had to characterize it, I would say I had a generally pleasant and carefree childhood. My parents were loving and kept us well supplied with Cocoa Puffs and bologna sandwiches. We had shoes on our feet and hats on our heads. (I tried it the other way around but the Red Goose oxfords kept falling off my ears. Besides, as the Red Goose Shoes commercial kept telling us, wearing them was “half the fun of having feet”. I never found out what the other half was.) And if Johnny Swaboda stole my lunch from me at fist-point every once in a while, well, that was just the cost of growing up dweeb. My parents were liberal-minded on child-rearing, not inclined to hem us in too much, but there were a couple of requirements that were iron-clad. 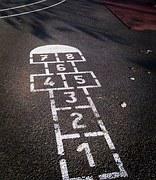 One, applying to our family only, was that we were not allowed to play hopscotch. This may seem strange now, but they were just following the wisdom of the times. You see, we lived in a glass house, and people who live in glass houses . . .. I think you can see their point. The other restriction that sticks in my memory was this: we were not allowed to cross the street until an adult told us it was okay. The street I grew up on was actually pretty quiet–cars passed at the rate of about one every two centuries– but none of the kids would dare cross it without some adult saying okay. It didn’t have to be your own parent; an aunt, the next door neighbor, even Johnny Swaboda’s mom could give permission. 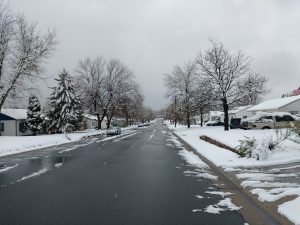 But regardless of the weather or time of day, permission from some adult was absolutely necessary, and none of the children in the neighborhood dared think otherwise. In order to attract the necessary adult attention, a child would stand by the curb, screaming in a sing-song voice, “I wanna go across! I wah-na gooooo acraw wawss,” over and over again until someone’s mother came to the door and said okay. At certain times, all up and down the street, you could hear the echos of children singing “I wanna go across”, sounding like plaintive Alpine mountain climbers melodically saluting each other from one peak to the next. Sometimes the response came quickly, sometimes you had to wait for what seemed like an eternity. If channel three happened to be airing “Queen for a Day” at the time you were crying out for permission, you were almost guaranteed to wet your pants on the wrong side of the street. I know it seems odd from today’s perspective, but such was American suburban life in the 50’s. Oh those halcyon days!